From California to Maine, Bee Raw Honey has worked with artisanal bee keepers to bring you some of the finest untainted and completely raw honey since 1999. 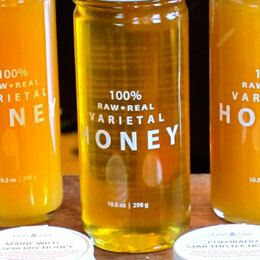 Because their honey is sourced from individual apiaries, each bottle of Bee Raw Honey has a unique color, flavor, and taste. You might think that the labels on the top of each jar are the flavors, but in reality, it's the plant that the bees were pollinating near. So instead of raspberry flavored honey, you get honey from bees that were living near raspberry plants. This slight hint of flavor makes each varietal completely unique and absolutely delicious. Use them for cooking or as a remedy for sore throats or allergies. There are infinate ways to use Bee Raw Honey but here are some of our favorite ways to use the varietals. Simply sweeten a cup of camomile on a cold night with their Sweet Yellow Clover Varietal ,or drizzle their Wild Black Sage Varietal over some baked fromage de meaux en croûte with toasted almonds for a sweet and savory treat.